“Infinite Present: Revelations from Islamic Design in Contemporary Art”—an exhibition at Cambridge Arts’ Gallery 344 from Sept. 17 to Nov. 30, 2018—brings together contemporary artists of Islamic heritage, who are reexamining the history and long traditions of Islamic pattern-making and calligraphy. An opening reception will be held in the gallery at 344 Broadway, Cambridge, on Monday, Sept. 17, from 6 to 8 p.m. The exhibition and events are all free and open to the public. Abstraction flourished over centuries in traditional Islamic art—from dazzling geometric patterns to flowing calligraphy—in part because of religious prescriptions against representational depictions of God and other holy Muslim figures. Patterns became a signature aspect of Islamic tile-work and architecture, embellished with tessellations of stars and triangles and polygons. Artists in the exhibition build on these legacies with new works that incorporate traditional Islamic motifs while reimagining them for today. The artists—Yasmina Alaoui, Nasser Al Aswadi, Dana Awartani, Kamal Boullata, Lalla Essaydi, Golnaz Fathi, Pouran Jinchi, Rashid Koraïchi, Peter J. Lu, Nja Mahdaoui, Hassan Massoudy, Walid Siti and Abdulla M. I. Syed—produce art ranging from the meditative and sacred to the politically-charged. Kamal Boullata endlessly repeats the word “Allah” in his calligraphy, while Nasser Al Aswadi, Pouran Jinchi and Nja Mahdaoui bend lettering toward abstraction. Lalla Essaydi challenges Western fantasies and stereotypes of Muslim women with photographs that reimagine 19th century European Orientalist paintings featuring female models today with calligraphy written across their bodies in henna. Abdulla M.I. Syed incorporates American dollars into collages to question American political and economic dominance. 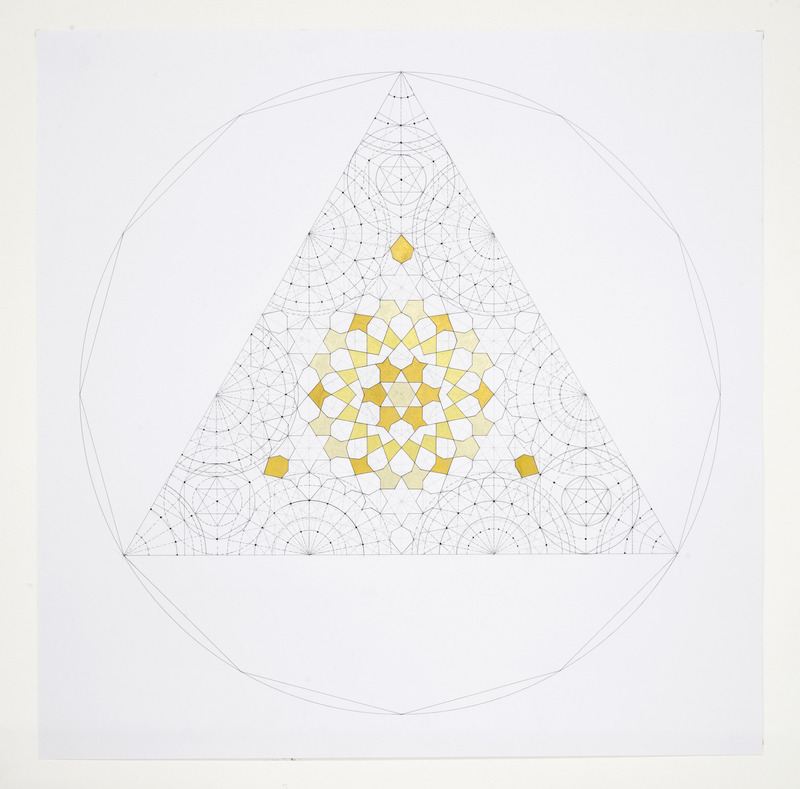 Yasmina Alaqui infuses traditional sacred Islamic geometric patterns with references to physics, biology, astronomy. Monday, Sept. 17, 2018, 6-8 p.m.: Opening reception at Gallery 344, 344 Broadway, Cambridge. Thursday, Oct. 18, 2018, 6-8 p.m.: “Decagonal and Quasicrystalline Geometry in Medieval Islamic Architecture and Beyond” | Peter J. Lu, a post-doctoral fellow at Harvard University, discusses connections between Islamic tile design and mathematical formulas. At Gallery 344. Saturday, Oct. 20, 2018, 10 a.m.-noon: Family Day | Tours of the exhibition paired with an art activity that explores patterns and calligraphy. At Gallery 344. The exhibition and events are all free and open to the public.